Hiawatha Cocker Spaniel Club, Inc. The Hiawatha Cocker Spaniel Club, Inc. (HCSC) was incorporated on Jan 24, 1947 forming a non-profit corporation in Minnesota. The purpose of this club is to promote the best interest of the American Cocker Spaniel by 1) encouraging breeding for improvement of the breed; 2) hold bench shows, field trials, obedience tests and other forms of competition and exhibition; 3) educate members in all phases of the foregoing activities; 4) develop judging talents and ability among its members 5) educate the public and further its interest in the breed and in all activities of the club in which its interest is desired, and 6) doing all further things that promote the welfare of the breed. The club is not organized for profit. Kay & Bart King were the original starters of the HCSC. Ten years after conception HCSC was one of the biggest clubs in the Nation with over 50 members and show entries of 80-100 for the first 8 years. The club attracted some of the best known dogs and their handlers. Hiawatha members promoted entertainment and were all great friends. Any club is its members and many have made a difference here. Every year, the club puts on a specialty show in Lake Elmo, MN. This August, 2009 will be the 66th annual conformation and 29th obedience specialty. The HCSC logo has been evolved through the years. An Indian head with a black cocker was the first logo used on the 29th annual show catalog and continued until 1977. The logo was changed on the 34th annual show catalogue to a cocker with head dress image by Judy Phillips. In 1982 it was changed to a cocker with head dress which was more defined. This image was by Karen Linden-Wilson. 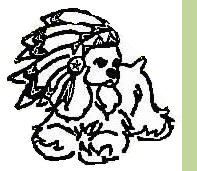 On the 1998 "The Hiawatha Cocker Tales" newsletter cover, a cocker with headdress looking sideways was added. This image was created by Valerie Jennings and remains to this day.